Military heroes are not grown in a field like cotton. when cowardice is not a consideration. The commander of the chief navy-yard of a country, in time of war, holds a post of great responsibility, and is compelled to do much hard work. Hence one of the ablest officers of the navy is usually selected to fill it. His work, however, is of a kind that neither interests nor attracts the public. He is aware of this, and therefore much prefers to be afloat and in active service. The daily routine of a navy-yard, and the superintending the repairs or building of ships, furnish tame employment compared with the bold cruise in search of an enemy, or the stern conflict, in which fame and glory may be won. But he has no choice in the matter; he must stay where the Government places him, and perform those duties which bring no renown, but yet are as essential in time of war to the welfare of the nation as those which command the public eye. Admiral Paulding, though ranking as one of our ablest officers, was doomed during the war to this monotonous life, as Commander of the Brooklyn Navy Yard. He was born in Westchester County, about the year 1800, and entered the navy in September, 1811. His father was John Paulding, one of the captors of Major Andre. A young midshipman, in the second war with England, he early saw some hard fighting with McDonough, in the battle on Lake Champlain, and so distinguished himself by his bravery, that Congress voted him a sword. After the war he made several cruises, possessing no especial interest, until 1825. In 1824, the crew of the whale ship Globe, of Nantucket, mutinied while in the Pacific Ocean, and, murdering the officers, took the ship to Mulgrave Island, where they proposed to burn her and form a settlement. Here they landed a great part of the stores and rigging; but, before she was entirely dismantled, some of the crew�who took no part in the mutiny�cut the cable one night, just at dark, while the rest were on shore, and, under a fine breeze, stood out to sea. The mutineers, seeing her moving off, pursued in boats; but soon, gave up the chase. All the nautical instruments had been taken out of her, so that those on board had nothing but the stars and prevailing winds to guide them in navigating the broad Pacific. They, however, at length reached Valparaiso in safety, and reported to the United States Consul there what had been done. There being no Government ship on hand that could be spared to go after the mutineers, the matter was reported to Government, which directed Commodore Hull, then in the Pacific, to send the schooner Dolphin in search of them, and bring them home as prisoners. Lieutenant Percival was put in command of her, and Paulding made his chief officer. It was a long cruise, for the islands of the Pacific were not so well known at that time as now. The Marquesas and neighboring islands were then almost terra incognita, and, as the vessel passed from one to another, a new world seemed opening to Paulding. One day embraced by the dusky wife of a chieftain, in return for some beads that he had given her; another, carried by an island king on his back to his boat, his cruise was made up of novel and ever-varying incidents. At length one mutineer was discovered on the shore of an island, who warned Paulding off. The latter asked him his name. He replied, "William Lay." Paulding then told him to come to the boat; but he refused, saying that the natives would not let him. "Run, then;" said the former. The poor fellow still declined, saying that the natives would kill him with stones the moment he moved. Paulding then disembarked, and, with loaded pistols, marched up to the place where Lay was standing, and, seizing him with the left hand, with the other presented a cocked pistol to his breast, and sternly demanded, �Who are you?" He replied, �I am your man," and burst into tears. The natives, thinking violence was intended, rose angrily, when Paulding leveled his pistol at them, and marched his prisoner off to the boat. A few miles to windward of this island he found another mutineer, by the name of Huzzy, who was stark naked, like the natives. The latter somehow had got wind of Paulding�s search, and hence knew what he was after, and planned that very night to board the vessel and murder the crew. Huzzy, however, dissuaded them from it. Paulding boldly landed, and, marching up to the chief, leveled a pistol at his breast and demanded that Huzzy should be delivered up. He yielded, and Paulding took his prisoner on board, when the latter informed him that all the other mutineers were dead. Paulding afterwards published a book, entitled "Journal of a Cruise among the Islands of the Pacific," in which he gave a minute account of this cruise, describing the various islands that he visited, and the customs of the inhabitants, etc., which were then new to the public. 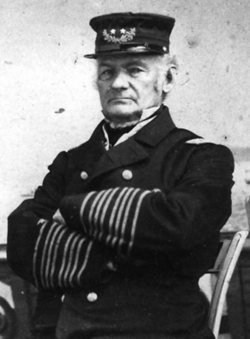 In 1844, he was promoted to Captain. Many years after, in 1857, Paulding figured in the famous filibustering expedition of Walker. The main body, commanded by Walker in person, landed at Punta Arenas, in the harbor of Greytown. Commodore Paulding, commanding the Home Squadron, arrived in the Wabash the next month, when Walker, with one hundred and thirty-two men, surrendered to him. Paulding acted in the matter without specific instructions, and his conduct was not fully approved by the government, especially in arresting Walker on foreign soil. Subsequently, the President of Nicaragua presented him with a sword, and offered him a large tract of land as a reward for his services, but the government would not allow him to accept the latter gift. At the breaking out of the rebellion, Commodore Paulding was ordered to supersede Captain McCauley, in the command of the Navy Yard at Norfolk, then threatened by the rebels, but, as it turned out, not to save it but to superintend its destruction. This Navy Yard was one of the most extensive in the United States, being three quarters of a mile long, a quarter of a mile wide, and covered with machine shops and buildings of various kinds. In the harbor were the new steam frigate Merrimac, the line-of-battle-ship Pennsylvania, the Germantown, the Dolphin, and other vessels. Nine millions of property were supposed to be in the yard, and among it three thousand cannon. All this the rebels expected to have, and troops were assembled to seize it. On the night of the 16th of April a large number of boats loaded with stones, were towed into the channel and sunk, so that the large vessels could not be towed out, and two days after, the rebel general Taliaferro arrived to take charge of the troops, when the federal naval officers resigned their commissions, and passed over to the confederate government. This state of things being reported at Washington, it was determined to destroy the yard and all its material, to prevent it from falling into the hands of the rebels. The Pawnee, Captain Rowan commanding, had just arrived from its fruitless endeavor to reinforce Sumter, and six hundred men were immediately put on board the vessel with Paulding as flag officer, and she ordered down to the yard. She started on the night of the 21st, with a bright moon to guide her on her course, and steamed down the Potomac. The next evening at eight o�clock she reached the wharf, and was received with thundering cheers by the loyal gallant crews, while the traitors were seized with alarm, lest the Pawnee should open her broadsides on everything within reach. Whether the government could have saved the yard, had it possessed more confidence and boldness, it is impossible to say, but the attempt was not made. Paulding ordered the troops, as soon as the Pawnee was made fast to the dock, to land and seize all the gates of the yard. He thought the Cumberland might be saved, and determined to try and tow her out. Everything that could be carried and was valuable, was taken out of the Pennsylvania and the other vessels, and then the work of destruction began. Some three thousand men sprang to their task with a will, and shot and shells and stacks of arms were thrown overboard, while the heavy guns could only be spiked. All night long the work of destruction went on, and it was nearly morning when the Pawnee, taking the Cumberland in tow, and with all the men on board except those left behind to fire the trains, cast loose and moved off a short distance. Everything being ready, Paulding ordered a rocket to be sent up, the signal agreed on for the torch to be applied. It rose gracefully into the air with its silent message, and as it "burst in shivers of many-colored lights," the men who watched its ascent, fired the trains. In an instant the flames leaped up in every direction, revealing the whole yard as by magic, and turning night into day. Startled by the mighty conflagration from their sleep, the citizens of Norfolk and Portsmouth rushed into the open air, and saw the whole heavens illumined as though the fires of the last day had been kindled. he flames leaped from the pitchy, smoking decks to the shrouds, and curled like fiery serpents round the tall masts, while on every side piles of material and dwellings became a mass of fire. Says a spectator of the terrific scene, "It was not thirty minutes from the time the trains were fired, till the conflagration roared like a hurricane, and the flames from land and water swayed and mingled together, and darted high, and fell, and leaped up again, and by their very motion showed their sympathy with the crackling, crashing roar of destruction beneath. But in all this magnificent scene, the old ship Pennsylvania was the centre-piece. She was a very giant in death, as she had been in life. She was a sea of flame, and when the iron entered her soul� and her bowels were consuming, then did she spout forth from every port-hole of every deck, torrents and cataracts of fire, that to the mind of Milton, would have represented her a frigate of hell, pouring out unremitting broadsides of infernal fire. Several of her guns were left loaded but not shotted, and as the fire reached them they sent out on the startled morning air, minute guns of fearful peal, that added greatly to the alarm that the light of the conflagration had spread through the surrounding country. The Pennsylvania burned like a volcano for five hours and a half, before her mainmast fell. I stood watching the proud but perishing leviathan, as this emblem of her majesty was about to come down. At precisely half past nine, the tall tree that stood in her centre tottered and fell, and crushed deep into her burning sides, while a storm of sparks flooded the sky." Paulding, with the Cumberland in tow, succeeded in getting out of Elizabeth River. His work was then done, and he left the Pawnee at City Point. Not long after this he was placed over the Navy Yard at Brooklyn, where he remained. He was one of the three appointed by the Secretary of the navy to investigate the subject of armored vessels, and to contract for the three first that were built: viz. the Ericsson, Galena, and Ironsides. He is now on the retired list. From a book of stories from long ago in America, we learned from the grandson of Adm. Hiram Paulding that he held family Bible reading every morning without exception, and his wife played hymns on the pump organ. He was no wimp, and he was a man in the words of Teddy Roosevelt given to "the vigorous life." He was fearless under fire and under command of himself. It is now politically incorrect, and probably repulsive to our Military Commanders, to be caught on their knees in praying. I believe that our American Military today has become an extension of the greed, arrogance, and godlessness of the USA at large. God help us the day they are given the command to attack "we the people." No one will be praying then but you and me. How can I be so pessimistic? Answer: You the people elected the most godless egomaniac we have ever seen as President. You will get what you asked for. Isaiah 10:16 (KJV) Therefore shall the Lord, the Lord of hosts, send among his fat ones leanness; and under his glory he shall kindle a burning like the burning of a fire. Hiram Paulding's father, John Paulding, with two fellow patriots, captured Maj. Andre and exposed the traitorous plot of Benedict Arnold. The apple does not fall far from the tree.